Geelong and The Bellarine is lucky enough to share their home with a plethora of wildlife. From birdlife to mammals, marsupials to reptiles, Geelong and The Bellarine has them all. Housed within their native region or placed within a tending sanctuary, there are numerous places where one can go to find out more about these captivating creatures. You may even find the opportunity to get up close and personal. An African adventure awaits you in Werribee! The Werribee Open Range Zoo; 225 hectares of wide, open savannah. Travelling to Africa has never been so quick and easy. The wildlife experiences that await you there are like no other in Australia. Meet Motaba and his two sons, Werribee’s silverback Gorillas. He and his boys are housed in one of the largest Gorialla exhibits in the world (6,000 square metres)! Enact your wildest (wildlife) dream and become a ranger on patrol at the helm of your safari jeep and come face-to-face with a pride of lions at “Lions on the Edge” exhibit. Wander the wetlands and spot the hippos. Trek through the Australian Journey Grasslands and watch 'roos bounds past, emus strut by and so many more Australian animals do their thing (brolgas, koalas, bandicoots). The Must Do – Undoubtedly, the safari bus tour (price of which is included in your entry). This tour allows you to be transported through the arid African landscape, observing (up close) amazing African animals in what feels and looks like their native home (giraffes, zebras, antelopes, bison, addax, rhinos, ostriches). All commentated passionately and knowledgeably by your very own tour guide. Serendip Sanctuary; 227 hectares of protected bush located near the sprawling You Yangs. This sanctuary is a birdlife wonderland, known to be home to over 150 different species of birds! Passionate about environmental education (in particular bird and wetlands ecology), Serendip has an abundance of info-tainment; theater, activities room, giant microscope (to examine microbiology and underwater world) and several signed, family-friendly nature trails. The Must do - The Wildlife Walk; an immersive journey with Australian wildlife. Wind past the grazing areas of emus and eastern grey kangaroos. As your tour continues, make sure you look to the skies. Kites (the bird variety, not the Mary Poppins variety) are often seen soaring overhead. Look among the reeds in the shallow waters you will most likely spot a wading yellow-billed spoonbill. And if you are really observant, try to spot the highly camouflaged and very cute Mr. Tawny Frogmouth. Specially designed bird hides along the way will also allow you to catch sight of even more of the 150 birds species living and breeding in Serendip. Jirrahlinga; Aboriginal for “seek a home for a kangaroo” is just that, a haven for injured wildlife. Established after the Ash Wednesday fires in 1983, Jirrahlinga is known to locals as the place to take injured wildlife to restore them back to optimal health. It has also earned itself a well-deserving reputation for being a therapeutic environment for people with disabilities and/or special needs. The tranquility of the setting and the interactions with the animals allows people to connect with the wildlife in a deep and meaningful way. Spend your time at Jirrahlingah absorbed in your animal encounters. There are kangaroos, emus, foxes, dingoes, wallabies, koalas, snakes, wombats, kookaburras, echidnas; a right royal Aussie line-up! And the best part, all proceeds go to supporting the work of the volunteers and the running of the sanctuary. The Must do – The interactive koala experience. At certain times of the day Jirrahlingah offer the cutest and most heart-warming of experiences; a meet and greet with Australia’s favourite ambassador, the koala. This memory-making experience is included as part of your entry fee! 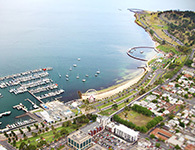 Queenscliff’s Marine and Freshwater Discovery Centre is located on the ecological utopia that is Swan Bay. The centre was created to raise awareness about marine and freshwater environments and the impact that commercial and recreational fishing can have on them. The aquarium, student laboratory, classroom and resource room allow for this to occur in a fun and interactive manner. Educational programs have been designed for early childhood, school and tertiary groups. With the centre being positioned in a prime location for marine exploration, the field activities conducted are always an amazing experience of discovery. General public are of course also welcome to enjoy this underwater paradise. The Must Do – The Holiday Activities Program. This program offers an ever-changing, adventure-creating experience. Snorkeling tours (in-shore and by boat), canoe trips and rock pooling are just some of the escapades featured in the program. To stay abreast of the program’s schedule, be sure to send an email request to marine.discovery@vfa.vic.gov.au. Dive into a serene and joyous experience with Sea All Dolphins Queenscliff and tick one of the classics off your bucket list. Sea All Dolphins offer the ultimate half day tour; starting off with mastering your snorkeling skills, then a playful swim with herd seals (these guys are so very cheeky) and finally, the much-anticipated swim with the dolphins. Age, size and ability form no barriers for this half-day adventure - the experienced and friendly crew make you feel so comfortable with your surroundings and capabilities. The Must Do – Feel the sea-air ripple through your hair as you ride the boom net. Board the mighty Maureen M (the vessel taking you on this epic adventure) is equipped with a very sea-worthy boom net that can carry up to four people. The boom net forms the base for their rope ride activities (another must do), letting you sit on the net as a pod of dolphins duck and weave the waves under you. It truly is as spectacular as it sounds. Each of the above sanctuaries, ranges, centres and nature-based experiences demonstrate absolute love and respect to their wildlife and environments. Educational messages strongly exist in all the encounters they offer while at the same time firmly creating the long-lasting, fun memories of time spent on the wild side.